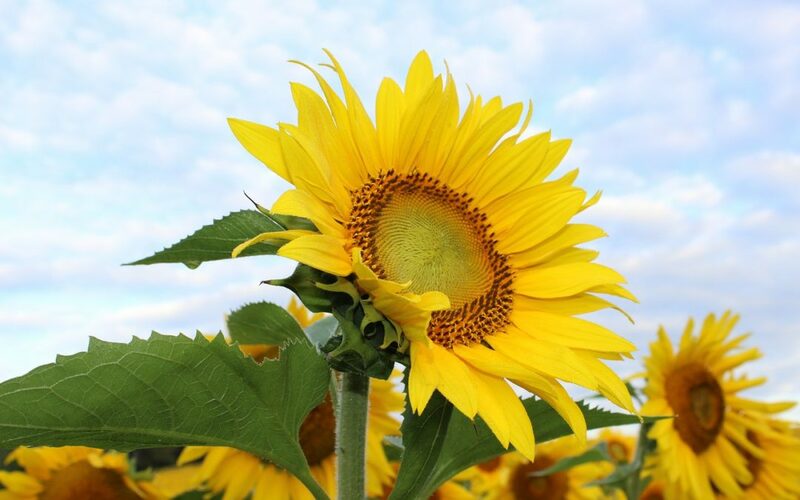 What Can We Learn From a Sunflower? Turn to the Sun. Getting enough vitamin D made simple for you. We often associate vitamin D with healthy bones, as it helps to regulate the calcium and phosphorous levels in our blood. While this is true, vitamin D also plays a critical role in our immune health. Vitamin D deficiency has been linked not only to bone conditions such as osteoporosis, osteomalacia and rickets, but also to depression, fatigue, hypertension, cancer and diabetes. Fortunately, your body can synthesize vitamin D from sunshine. As a general rule, it is recommended that you spend 15 to 20 minutes a day with 40% of your body exposed without sunscreen for maximum benefit. For more specific information based on age, skin type, latitude and season, visit www.vitamindcouncil.org. If sunshine is not available or being exposed to the sun is not possible, supplementation is an option. We recommend taking the sunshine vitamin in D3 form. Make sure you do your research to ensure that you are taking a high-quality product. After all, if you are going to spend the time and money to take a supplement, doesn’t it make sense to take a high-quality product? Vitamin D3 supplementation is also highly recommended for those younger than 20 years of age and over 60 years of age, as their bodies are less efficient in synthesizing vitamin D from sunshine. Kids under 1 year – 1,000 IU. Kids over 1 year – 1,000 IU per every 25 lbs of body weight. Adults and adolescents – at least 5,000 IU. Additionally, children and adults with chronic health conditions such as autism, MS, cancer, heart disease, or obesity may need to double these amounts. Keep in mind that these amounts are higher than the FDA’s recommended amounts. How much is too much? Vitamin D is a fat-soluble vitamin which means it can be toxic in extremely high amounts. Vitamin D toxicity is very rare, and taking 50,000 IUs/day of vitamin D for several months has shown to cause toxicity. This level is many times higher than the recommended daily allowance. Since so many people are vitamin D deficient, doses higher than the RDA are commonly recommended to replenish a person’s vitamin D stores. For optimum health, vitamin D blood levels should be around 50-80 ng/mL (125-200 nmol/L). A 25-hydroxyvitamin D, or 25(OH), test can be ordered to test your blood levels. Always consult a medical professional before taking vitamin and mineral supplements. The great thing about getting your vitamin D from the sun is that your body will never make more than it needs. So, don’t be afraid to go for a walk on your lunch break and catch some rays. Ask us about supplementation next time you are in the office, or call (619) 313-5403 for more information.